Midway through the very first #TeachWriting Twitter chat last night, I finally chimed in. I had other things going on and so I didn’t get home until the halfway point of the chat, a bi-monthly chat on Tuesday nights centered around the teaching of writing. The brainchild of Lisa Hughes and Ben Kuhlman (maybe others? not sure), #TeachWriting is another way for teachers to share with and learn from each other, in the fast-flowing realm of Twitter chat. A few months ago, Troy Hicks and I offered up some feedback to Lisa and Ben as they were planning because Troy and I have done these kinds of chats before (including one together, via NCTE for Digital Learning Day.) Really, though, Ben and Lisa did fine on their own. But when Ben shouted out earlier in the week that he hoped to see me at the chat, I knew I had a conflict and might miss it. I’m glad I caught the second half, as the flow of discussion was amazing, rich and expansive, and there were many people in the Twitter Chat that I had never run across before (an ancillary gift from #TeachWriting). It’s heartening to know that so many folks care so deeply about writing, and want to know how best to get their students to care about writing, too. I was a little worried that Lisa and Ben might only have a few folks, but … not a worry! Dozens of people seemed to be involved, sharing ideas and asking questions, and making connections across disciplines and time zones. It was the perfect example of the power of a Twitter Chat. One word of advice, if you have never joined in a chat: consider using a Twitter Chat client of some sort. I use TweetChat but there are others that allow you to focus on specific hashtags. 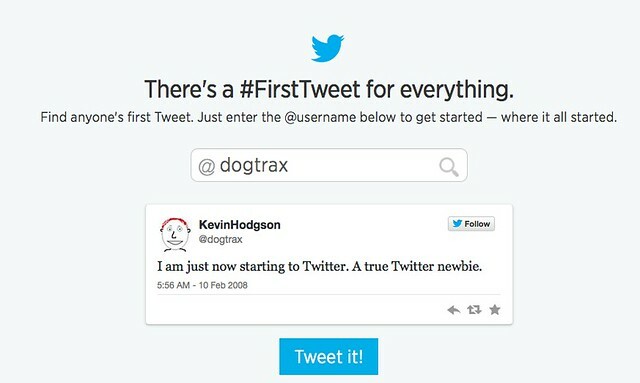 Twitter has done something interesting for its 8th birthday: it is allowing folks to find their very first tweet. I couldn’t resist — mainly because I couldn’t remember how long ago that was nor could I even vaguely remember what I wrote for my very first tweet? But 31,000 tweet later as @dogtrax (I know? What the heck do I write about? I don’t know), I am still wondering how to push the boundaries of the 140 characters. I write 25 word stories, tinker with hashtags, collaborate across the world, make memes, take part in Twitter chats, share with others and steal from others (and remix what others are stealing from others). My professional development will never be the same. It’s an odd thing, this Twitter. I started to use Twitter in 2008 a few months after a National Writing Project gathering in Amherst, where Bud Hunt (aka @budtheteacher) chatted over dinner one night about this thing called Twitter, and he wasn’t quite sure of all the possibilities and potentials for writers, but he was pretty confident it was not a flash-in-the-pan kind of technology. He grappled to explain it to us, and we grappled to understand. 140 characters? A stream of tweets? What the heck is he talking about? As usual, Bud pointed us in the right direction. I started tweeting and haven’t stopped (see this post from 2008 that collects my first few tweets.) It’s true that not everyone cares or should care about what I post, but every now and then, something clicks and connects — some ideas that suddenly transforms your view of the world or your view of teaching or your kids, or technology — and in that moment, the power of Twitter is suddenly exposed. You do have to get through a lot of LOL Cats to get there but …. you know … it’s worth it. I am intrigued by using the short form to create engaging writing. Here is a potentially fun site. Twister (part of the Classtools.net suite of interesting activities) is a Twitter spoof site, in which you find someone from history and “create” a fake Twitter site and tweet. 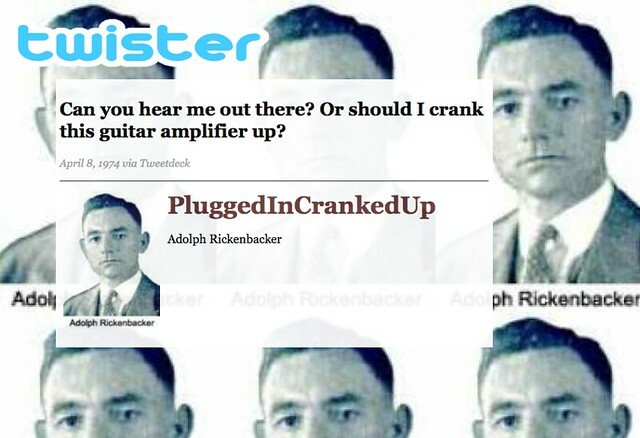 I did this one for Adolf Rickenbacker, one of the founders of the electric guitar. The Twister site gives you a few boxes for information (username, real name, tweet and date) and then creates a single page that looks like this one. There is even a bank of exemplars, and I wonder if this might be a nice extensive activity for students doing research on a historical figure. 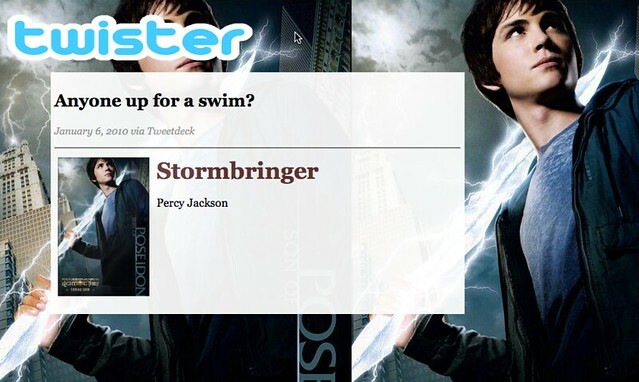 I didn’t think it would so well with fictional characters but then I tried one with Percy Jackson, and it seemed to work just fine. What’s interesting is coming up with a Twitter username (here, you might teach theme) and what kind of short text/tweet they might send out to the world. It shouldn’t be just random and yet it shouldn’t sound like a historic document either, so you are crafting a page that has personality. That’s an intriguing project for a student, don’t you think? Yesterday, a colleague in the National Writing Project’s Making Learning Connected MOOC made an observation about the Twine video app that brought something into focus for me. Elyse Eidman-Aadahl observed that while the six second limit on the video is short, one could almost imagine using twine as “haiku” and that reminded me of an interview that I read in Wired Magazine with the creators of Twine about how they envision folks having just enough time to film 2 second beginnings, 2 second middles, and 2 second endings to create a short narrative. At first, I was thinking: yeah right. Two seconds to set a story in motion and four seconds to complete it? It seems almost impossible to do so. But then Elyse’s comment about video haiku kept coming into my mind — what we did see the video in three parts. I wondered if it would be possible to tell a story in six seconds. How could you film something and leave much of it out? What would you expect the audience to infer? A story began to form in my head … of writing to your future self. The story would begin with an envelope, addressed from the present self to the future self (in clear lettering, easy for viewer to read quickly); the next part would be crumpled up papers, showing frustration about what to write — and these would be mostly negative starts; and then ending would be a letter about love, being stuffed into the envelope to the future self. It would capture in six seconds the idea of what we want to pass on to ourselves in the years down the road. Hopefully, that would be love, and not worries, fears, and negative energy. What do you think? Although I shot the video in three short takes, I thought about the “story” for hours yesterday, visualizing how I would film it. Six seconds? Not a lot of time. But if you think of it like video haiku — three parts, looping over and over, hinting at something larger– Vine as a venue for storytelling starts to have possibilities. See what you can make and share it out. Let’s inspire each other to push the technology in creative directions. Tell a story. You have just six seconds. Make each second count. But with other friends in the Making Learning Connected MOOC starting to share their own vines, and looking for others to become part of the experience, I dug out the app again this morning, and decided to capture how important coffee is to my morning reading and writing experience. I sequenced it out in my head with four short scenes, and … it’s not bad, I guess. 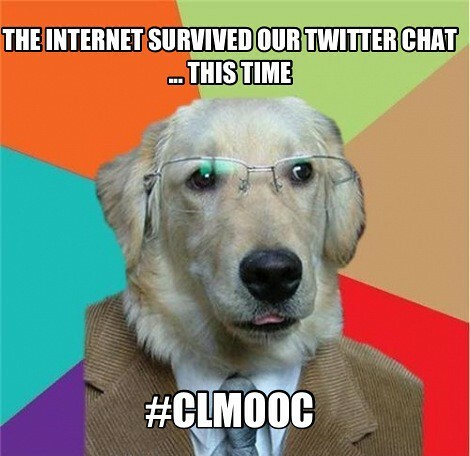 We hosted our first Twitter Chat last night, and boy, talk about a mad rush of ideas. I’ve taken part in chats before, but to be (with my friend, Terry) one of the facilitators as tweets come fast and furious was interesting and little breathtaking in its pace and speed. The hour flew by and before I knew it, we had begun and ended. 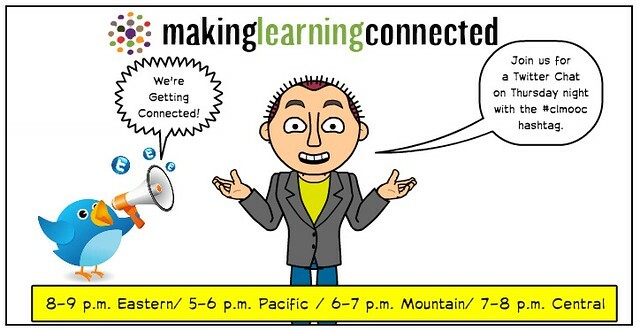 In between those time warp moments, though, a slew of folks chimed in about where they were from, what they were doing in the Making Learning Connected MOOC, how they were making connections, and more. Topics moved from the digital versus non-digital “makes,” and the use of infographics in the classrooms, and how to make connections with others outside of the MOOC. There was more sharing of technology tools, and instructions on how to begin to establish stronger connections within the community. It was fascinating to see the conversations unfolding, blasting down the screen. Terry and I had a list of questions ready, which we popped into the mix every now and then, but for the most part, our job was welcoming folks and validating ideas, and asking questions to spur the conversations further along. You know the phrase, herding cats? That was what it was like, but in a good way, as if all the cats were purring and ready for play. And in fact, the beauty of the MOOC community that we are helping to establish is that it can be self-sufficient, and supportive from within, with only minimal structural help from the facilitators. That’s a wonderful thing. Last week, I had the pleasure of taking part in an ongoing collaborative Twitter adventure with my National Writing Project friends at the Digital Is site. A handful of us have signed up to take on the “digital is” handle (@NWPDigital_is) on Twitter for a week at a time, sharing resources and encouraging discussions through the shared identity of Digital Is. It reminds me of how identity is often in flux when we use digital tools, and while it is easy enough to create multiple accounts, it is not as easy to maintain individuality and voice when you have more than one “you” on the stage. Who I am in this moment of time, and who I want to be represented as to a larger audience, is a critical question. You need to experience it from time to time in order to better understand the implications for identity with your students, and then think about how to teach that skill. There’s value to being part of multiple voices (such as this @NWPDigital_Is venture. You can also see from my screenshot that I have access to our feed from Western Massachusetts Writing Project and my classroom) but in the midst of it, you can feel the pull and tug of those multiple voices, too, splintering your message in ways you don’t quite grasp until you find the time to reflect, and write. In the vein of sharing Digital Is resources, this one by Peter Kittle — Inquiring into Distributed Identities — hits the points I am trying to make here in this post. Another — Teachers Tweeting Teachers: Building a Community of Practice through Tweeting — talks about the benefits of a shared tweeting experiment.